Sweet little Pudding is a petite, pretty, white & tabby cat who loves human company. She has a very calm temperament and loves to be cuddled, purring with contentment when you pick her up and tickle her ears and chin. 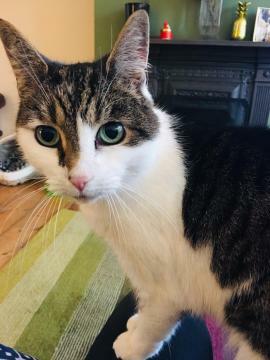 She's happy curled up on your lap or snuggled next to you on the sofa, and likes to show you her affection by gently putting her paws on your face! Pudding would love a home where there are people around for much of the day so she can get lots of fuss and enjoy being a loyal companion.